This is the story of a wealthy hotelier, who has always been used to having a suitcase packed and ready and living in his very smart hotels on the edge of Lake Garda. This is the story of a die-hard single, who, at a certain point in his life, felt the need to find his buen retiro, a place that he could call his own, that was truly “home”. It is this very home that reveals the romantic side of our protagonist and his idea of home: a wood-burning fire. Make that two. The first is Scenario, MCZ's innovative fireplace-TV, installed in a very bright open space, where the outdoors enters impertinently, eliminating the barriers between interior and exterior. The large windows make the natural light and splendid view of Lake Garda the protagonists of the decor itself. 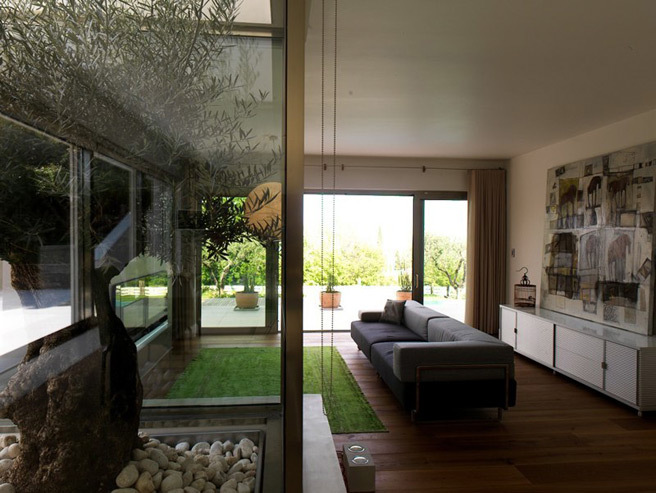 Nature even comes into "physical" contact with the inhabitants, through the century-old olive tree that reigns from its case between living room and kitchen. From the grey sofa you can now enjoy watching the fireplace or the television. The cladding is designed specifically to guarantee perfect insulation of the electronic appliance, so that it does not overheat while the fireplace is running. Also, the visual aspect has been designed so that flame and TV images do not "interfere" with each other. 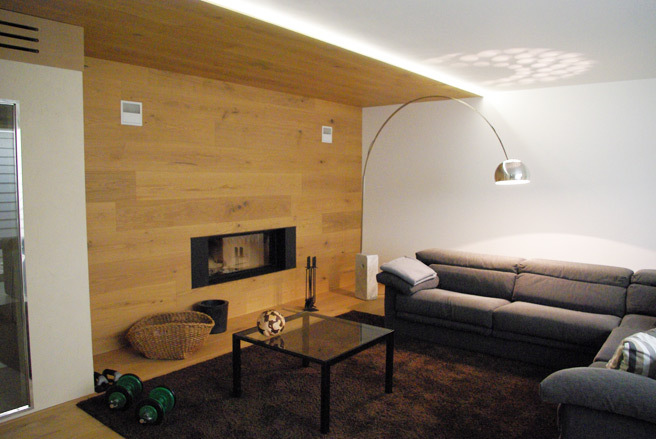 The owner wanted a second wood-burning fireplace (an MCZ Forma 95) in one of the cosiest areas of the house: the meditation area created outside the sauna and small gym. An absolute dream: the glow of the fireplace warms body, eyes and soul, while you sip a hot herbal tea wrapped in a bath robe, relaxing on an armchair. The sensation of well-being is enhanced by the extensive use of wood surfaces, which envelope the entire room, from the floor to the walls. The fireplace cladding was chosen from the catalogue, the Klee model, made with slate stone with a natural split and with rust-effect, painted steel. To build the smoke outlet for the two fireplaces, the architects created a single air shaft, housing both flues. It is an interesting solution to prevent an unsightly double chimney on the roof, however, it needs to be designed carefully. The flues have to extend out of the roof at different heights. If they are the same height, and only one fireplace is running, which is the most common scenario, this poses the risk of creating an air vacuum and having the smoke return into the colder room.